Women Entrepreneurs India offers support to women looking forward to start a business with ideas that coincide with their abilities, interests and skills. Started in the year 2013 by Mahalakshmi Saravanan, WEI strives to educate, train, support and motivate women entrepreneurs all over India, through innovative business ideas, startup funding avenues, marketing support and mentor connects. .
Women Entrepreneurs India also provides optimum awareness on the existing funding avenues that could scale up their business. Startup funding support from WEI gives women a helping hand in establishing a business that could sustain market pressures and competition. This support system is also extended towards women entrepreneurs who are planning to upscale their existing business. With a national presence, WEI plans to support the ventures and ideas of women from the urban and rural sections with equal vigour. Women Entrepreneurs India has a well-rooted institutional capacity and alliances with able mentors, trainers and marketing professionals, to support women in all avenues of their entrepreneurial dreams..
You can become a member of Women Entrepreneurs India through a formal and free of cost registration process and bring about a progressive change in your entrepreneurial life. 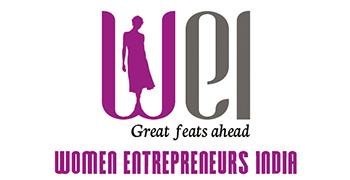 WEI aims to create a robust eco-system of women entrepreneurs who connect on a regular basis to exchange best practices, new ideas, and widen their areas of opportunities. A professionally woven system of women entrepreneurs can attend workshops and training sessions organized by WEI and conducted by experts in the industry, to keep themselves up to date with the latest trends in the business world. Mentors share their legal and financial knowledge about how to run businesses successfully through WEI. Be part of an engaging platform of enthusiastic, energetic and emerging women entrepreneurs to be & inspired	empowered constantly. Be amazed by the wealth of knowledge and information shared through a stream of educators and mentors, and allow your business to bloom and prosper. To harness the power of women entrepreneurs, while providing a structured and supportive network for conducting business, showcasing their talents and strengths, building business opportunities, and offering mentoring services to enhance their entrepreneurial skills. "I joined WEI a few months ago and since then I have been able to obtain greater visibility. Recently, through Women Entrepreneurs India, my profile was featured in the economic times, Bangalore edition. I have also been able to network with the right people for enhancing my business"
I am involved with WEI as an active member . I support the organization because I know first hand the impact diversity of thought, beliefs and lifestyles can have on a teenage mind, and WEI is committed to diversity. In fact one of the stated goals is – we learn from difference. I encourage others to support WEI because their programs create opportunities for women to find their voice and and are accustomed to entrepreneurial thinking. WEI offer members time and space to be connected to women of all ages, from a wide range of backgrounds and who are invested in sharing experience, exchanging ideas and learning from each other. I have met many of the women in the community and have been very impressed with them and their ideas. Many of the women come from different backgrounds and WEI provides skills and mentorship to help them succeed. The women who participate are very motivated and enthusiastic about being a part of it .